Durban House, where DH Lawrence used to go to collect his father’s mining wages, is now the DH Lawrence Heritage Centre. It houses information and artefacts relating to the writer’s life, and hosts annual events and exhibitions. 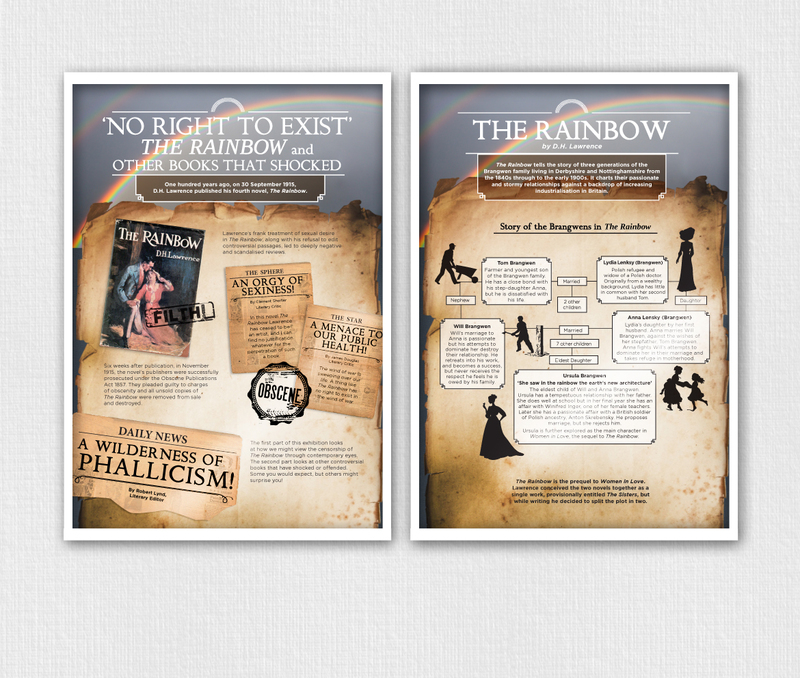 With a new exhibition approaching ‘No Right to Exist: The Rainbow and other books that Shocked’, the centre decided to have boards created with all the information they have, shown in a creative way. Title vinyls and signs also needed to be designed to put up around the exhibition area. To begin, title vinyls and signs were created in a stencil style for the exhibition manager to ‘cut and stick’ where they wanted around the exhibition. 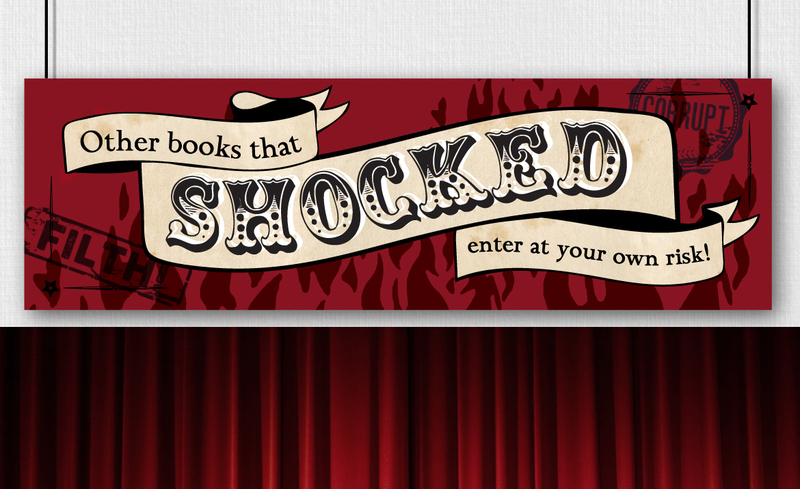 These match the main image vinyl you see below the title as you walk in – a pile of burning books. This symbolises how some books have faced being burnt due to their apparently repulsive, vile or sexual content. With the theme of banned books, and burning books, backgrounds of the information boards were made to look like burnt paper. Victorian style silhouettes were designed and used throughout to relate to the period DH Lawrence was alive, and rainbow imagery was used to reflect Lawrence’s own banned book, The Rainbow. A selection of the boards were designed in the style of Twitter. These modern-looking boards portray conversations between DH Lawrence, his friends, publishers and magistrates, telling the story of how his book became banned. Throughout the exhibition you are also persuaded to give your views on the whole matter via the Twitter account @DH_Lawrence. 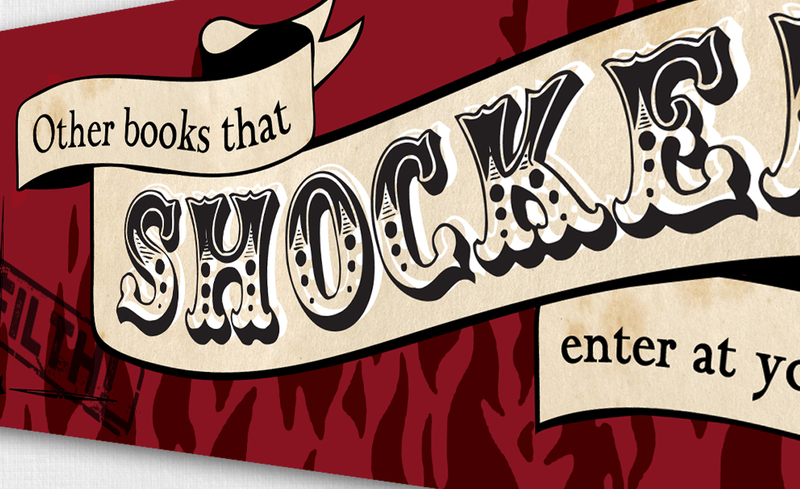 This brings to life the perceived dangerous and subversive nature of the books, and it’s as though you are walking through the curtains into a freak show of literature.